Champagne Cupcakes for a Bubbly Brunch! When it comes time to celebrate, bust open the bubbly and throw a champagne brunch! Check out some of our favorite boozy, bubbly desserts to delight your guests or impress your hosts, and let us know if you have any signature champagne desserts for festive summer gatherings! Be sure to check out our Brunch page for more recipes and inspiration! In the words of our favorite Shakespeare heroine, “What’s in a rosé? 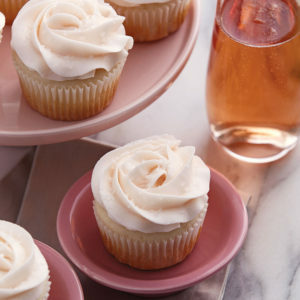 A wine by any other name would taste as sweet.” And just like Juliet, you’ll fall in love with these rosé champagne cupcakes. Made with Rosewater Buttercream, these sophisticated bite sized desserts are the perfect addition to any brunch event, like day-after wedding get-togethers or bridal showers! Throwing a champagne brunch is a perfect way to celebrate the woman who does so much for the family. 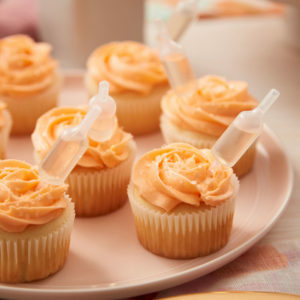 Pop open some bubbly for mom and treat her to these cupcakes inspired by everyone’s favorite brunch beverage – the mimosa! Start your brunch off with a bang! with these delectable French 75 cupcakes. The cocktail itself dates back to the 1920s and consists of gin, lemon juice, sugar, and of course, champagne! The drink earned its namesake because of its killer kick, and your brunches will earn a reputation of their own for their brilliant, boozy desserts! Simple yet decadent, these champagne cupcakes are the perfect accompaniment to any celebratory brunch. Easy to bake and decorate, these are ideal for last minute get-togethers when you want to impress! Plot twist! While these treats aren’t cupcakes, they’re nonetheless made with our signature champagne brunch ingredient and are sure to be a hit! Smooth meringue gets a fizzy touch with the added champagne, creating a truly unique brunch treat. Try them this summer, just make sure to eat them before the summer heat melts them! 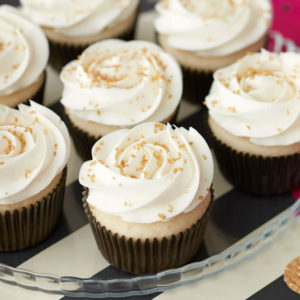 Do you have any champagne cupcake favorites that you’d like to share? Let us know and follow us on Instagram @wiltoncakes for more brunch inspiration! You have a phone number posted for placing an order, but you also might want add the hours that it is taking calls, and Central Time, since it is not open 24/7. I don’t know whey I am only posting this now since I made these in May but for the Royal wedding (Harry and Meghan) – made strawberry and sparkling wine cupcakes that stole the show. Everyone was super entertained by these filled with sparkling wine and it ensured that the cupcakes weren’t a soggy mess. « Soccer Cupcakes for the Big Game!